To keep your car in the best shape possible we offer extensive scheduled maintenance services. Our highly qualified technicians are able to complete factory services in our independent shop, so you don't have to return to the dealership. At Freeport Automotive we always use the finest parts for each and every service we conduct, ensuring a safe, reliable and comfortable ride. It is important to check your vehicle owner's manual for a detailed description about when your car or truck is due for certain services. When it comes time for auto maintenance in Sacramento give Freeport Automotive a call. We look forward to servicing your vehicle! 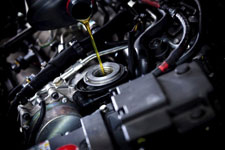 In order to keep your vehicle's engine running smooth it is necessary to provide it with regular oil changes to ensure the moving parts of the motor are properly lubricated. Oil changes essentially clean out the inside of the engine, removing dirt, grime and other buildup and the new oil helps restore fuel efficiency and power within your engine. Most vehicles require this service between every 3,000 to 5,000 miles, but be sure to talk with one of our technicians to find out how often your car should have this service based on driving habits and total mileage on the car. The ASE certified technicians at our repair shop conduct vehicle maintenance services, including 30/60/90K maintenance, fluid flushes, such as power steering fluid flush, brake fluid flush, automatic transmission fluid flush, differential flush, cooling system flush, safety checks and more. We follow factory guidelines and use OEM parts in order to keep your car's warranty valid following scheduled services. The term tune up has evolved quite a bit over the past century, but essentially it means providing your car with necessary services as they come about to keep it running right. This includes air filter replacements, fuel filter replacements, spark plug replacements, spark plug wire replacement, fuel injector service and more. Give us a call anytime your car seems to be running rough so we can get it back up to speed! Never put off scheduled maintenance, as doing so can result in a need for expensive repairs. When your vehicle is due for service call Freeport Automotive at (916) 389-2405 to set up an appointment for factory scheduled auto maintenance in Sacramento! We promise to provide your car with only what it needs, and nothing it doesn't! "This business has excellent service."